I recently discovered not everything works out as expected in the life of an allottmenteer. Some crops fail, some crops thrive and some just REALLY surprise you! My surprise came in the shape of the potatoes. Well, where shall I start….let’s say it’s not gone quite to plan…! ROTTEN! They were the International Kidney (Jersey Royal) and although we’re currently enjoying fabulous weather, it appears they REALLY did not like the recent persistent wet weather and succumbed to blight. It’s such a shame really as these were our mid-season potato experiment which as you can see, didn’t quite work out as expected. Definitely in the ROUGH category! 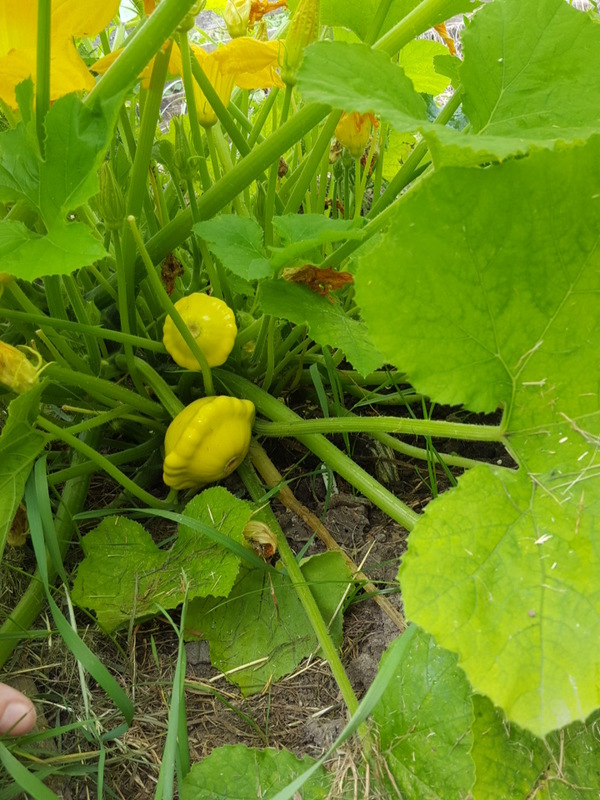 On a much cheerier note, these are the marvellous Patty Pan summer squash which I’m growing for the first time… mainly because I was given a free pack of seeds! I’m so happy with them, don’t they look pretty! Just like little yellow flying saucers. They taste jolly good too and the plant is looking very robust with very little effort on my part. Result!